In order to understand the competitive landscape and dynamics thoroughly, possibilities and threats, we believe it is imperative to analyze the external and internal situations, all major drivers including industrial as well as macro key drivers. This is what we call a 360° Analysis. The innovation analytics results in tangible key data that can be used to model or remodel the business, the overall strategy, and the related change and transformation projects. In recent years, it has become obvious that digitalization and automatization have fundamentally changed the competitive landscape. Due to rapid global market growth, opportunities and threats are constantly increasing. Combined with the forces of digitalization, the speed of business has reached a new high and is increasing faster continously. In less than two decades from now, over half of all jobs available today will be digitalized and new business models and jobs will be created to reflect this evolution. Common creative solutions, crowd sourcing, social media, online intermediaries and MOOCs are just a few of the underlying driving technologies that are fundamentally changing the landscape, opening a window of opportunity to firms with innovative capabilities to service and drive these new markets. These capabilities include multi-strategy capabilities, the use of in-depth consumer insights, an agile organization, advanced networking and linkages, platform thinking, and technology watch to mention just a few. Over the last decade, Innovation360 Group’s founders have studied what innovative capabilities must be in place to explore and commercialize modern opportunities while, at the same redundant, negotiating increasing global threats such as counter players and technological innovations. By building and organizing the largest innovation capability database in history, InnoSurvey®, Innovation360 Group is able to bring efficient 360-degree analysis to your company. In our 360-degree analysis, we collect and analyze external and internal linkages in preparation for the next step, which is linking it to the “business model” and the intent of your act (see Business Model and Strategy Innovation). Our 360-degree, innovation analytics is data driven, both qualitative and quantitative, and compares and contrasts the key drivers, as well as the organization’s resources and capabilities. This results in both improved financial and operational results for your organization. We believe that the utilization and development of the balance sheet in a broader sense (including non-financial assets), together with a deep understanding of the key drivers (macro and industrial), and market logic, as well as, disruptive technology (digitalization and automatization) is the key to present and future success. The InnoSurvey® innovation capability measurement, as presented here, is based on a combination of our underlying Innovation framework and our large Innovation database. 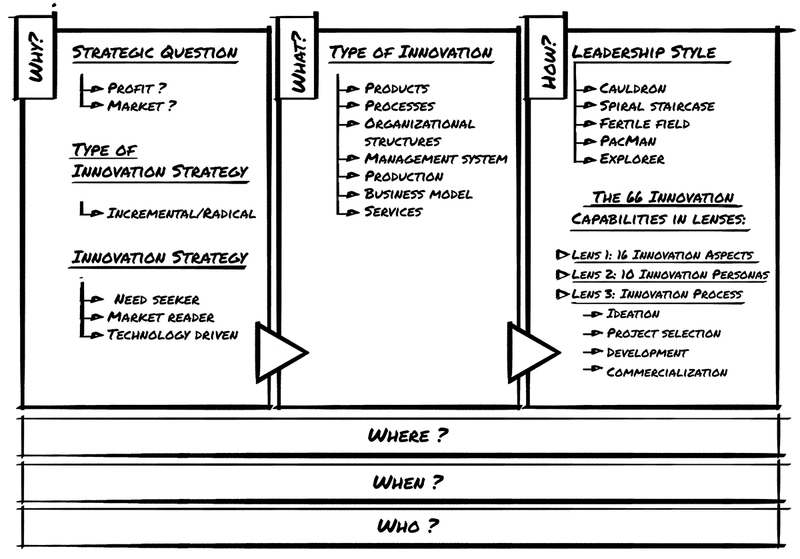 The Innovation framework is defined by five strategic questions (see the figure to the right) and is based on decades of research and practice, and, therefore, represents a very powerful tool and foundation for InnoSurvey®. Get in Touch to make smarter decisions and optimize business innovation and performance. The simple question “Why innovate?” leads us to examine the strategic nature of innovation. We know innovation is a strategic necessity, because the purpose of innovation is to ensure that your organization survives, and the evidence overwhelmingly shows that any organization that doesn’t innovate probably won’t stay in business for long. Hence, the innovation process should be aligned with the organization’s strategy, and innovation should be a key factor that defines how the strategy will be realized. The relationship between strategy and innovation, and the condition that they are enabling and driving each other, is an essential cornerstone of the Innovation360 Framework. The why questions cover whether the organization aims for profit or growth. In the case of NGOs and NPOs, profit can be interpreted as utilization, for example citizen/member advantage or usage. The why questions also address the degree to which the organization focuses on small, incremental improvements or radical innovation, whether the organization is pursuing both at the same time. Product Innovation: the development of a new or improved product. Process Innovation: the development of a new process, for instance a manufacturing process, talent-management process or supply process; typically driven by digitalization, automatization, robotics, artificial intelligence, and new man-machine interfaces such as tablets and smartphones that can be integrated in managing and optimizing processes. Organizational Innovation: a new venture division, a new innovation center, internal communication system, and introduction of a new accounting procedure are some examples. Management Innovation: examples include TQM (total quality management) systems, BPR (business processes reengineering) and Agile Development for software engineering. Production Innovation: quality circles, just-in-time (JIT) manufacturing systems, new production-planning software as well as new, more advanced and technology-related areas such as Industrial Internet of Things (IIoT) used to connect machines to each other as well as to producers, operators, and even customers. Commercial/Marketing Innovation: can be new financing arrangements, new sales possibilities, pricing models with low-entry process levels, market approaches (e.g., direct marketing); this can also be referred to as business-model innovation, meaning the development of new or improved business models and value propositions. Service Innovation: examples include Internet-based financial services (typically referred to as FinTech), user-experience-based service innovation using new interfaces like virtual reality and augmented reality. By linking why with what, we delineate the strategic rationale of the innovation-management work within the organization. The Cauldron: an entrepreneurial style where the business model is frequently challenged. The Spiral Staircase: a style where you climb upward without losing the overall goal. The Fertile Field: a style where the organization tries to use existing capabilities and resources in a new way. The Pac-Man: a style where you invent, outsource, and finance startups. The Explorer: a style where you explore possibilities and invest time and money in them without demanding short-term profit. 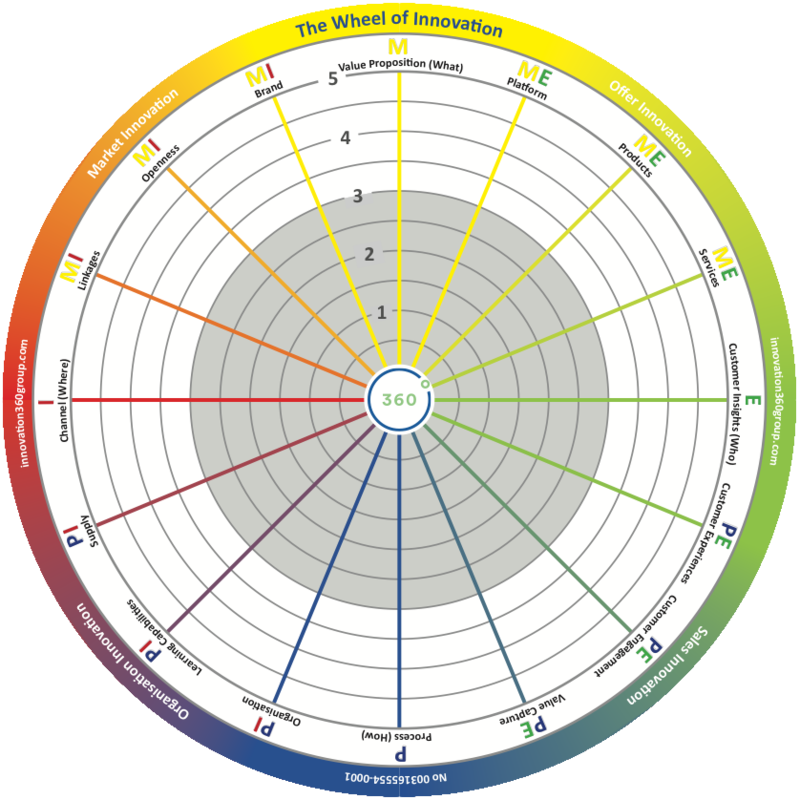 The sixty-six capabilities in the Innovation Framework are organized into sixteen aspects to simplify the analysis, all decribed in the Wheel of Innovation®. The Innovation process, consisting of the phases ideation, project selection, and commercialization. The one innovation refers to all people participating, internally and externally, in leaving ideas all the way to testing them, prototyping, developing to launching them. Typically, you organize people into innovation board, innovation task force, sponsors, project leaders and process owners. The simple answer here is “All the time!” However, every activity in a business needs to be assessed to fully understand its impact, and this is especially the case for creative work such as innovation. It is imperative to fully understand what is driving value and to measure the work effort and the end results in order to optimize the outcome of the innovation work. In the Innovation Framework, we therefore assume that innovation will take place constantly and at a high pace and that it will be guided and monitored by metrics and coached for value and results. Optimization in a red ocean, i.e. sticking to what you have and trying to optimize with low short-term risk. However, this also implies long-term risk as you most likely will become outdated at some point. Blue Ocean strategy initiatives means higher risk short-term but, if successful, a high margin and volume for a period of time. Uncertain market. Hard to predict trends. Short-term cash flow, no room for failure and no need for jackpot. Expensive and inflexible production system, meaning you cannot easily adopt a new kind of production. High level of competition, disruption and shifting market logic. In Innovation Leaders recent Master Class, “Innovation by the Numbers,” we explored how innovation metrics and analytics could be used to move company strategies forward. The session was hosted by innovation expert and Innovation 360’s CEO Magnus Penker. 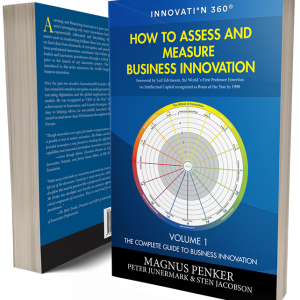 Penker provided key insights on how to organize and manage innovation based on analytics. He also addressed how to assess and measure innovation, how to build and coach on strengths versus compensating for weaknesses, and took questions from the audience. Penker also presented personalized data slides that participants contributed to by taking the innovation assessment survey, InnoSurvey, before the Master Class. Answer the different questions of the innovation cycle using data metrics from the innovation analytics. Contact us to learn more. Innovation is the art of thinking differently, and no modern tool is better at investigating new directions for thought than artificial intelligence (AI). That’s why Innovation360 has just announced the official launch of their own next generation AI platform. His name is Sherlock and his powers of observation are quite literally super-human. His mission is to uncover hidden concepts within the world’s largest database of innovation data. Innovation360’s Sherlock was created to be the first AI platform for innovation management – trained by input data from over 1000 companies in 62 countries. Combining and recombining ideas from every continent, Sherlock is truly a global project and is meant to be a resource for the leaders of tomorrow. As Sherlock draws from such a massive, diverse dataset, the development team at Innovation360, knew Sherlock couldn’t come online until he was 100% contextual and tuned to the language of innovation management. Sherlock’s guiding principles are based on logic from the last 100 years of innovation research, including insights from Innovation360 consultants and licensed practitioners who have worked with NASA, Spotify, McKinsey and Co., Harvard University and myriad of similar organizations. Sherlock’s development studio featured parallel automatic and semi-manual training, using parameters that included layers, neurons and activation functions for error detection and iterative learning. The team was diligent in embedding code for mechanisms which protects against de-learning and overlearning. Moreover, and perhaps even more significant, Innovation 360’s ideation experts continuously test the limits of Sherlock and tirelessly add new input and output neurons to its network. In The Adventure of the Copper Beeches, the 19th century consulting detective Sherlock Holmes famously told his trusty assistant Watson, “Data! Data! Data! I can’t make bricks without clay.” Now at last his 21st century counterpart has all the data he needs, with more coming in every day from inventive entrepreneurs and thought leaders within corporate innovation initiatives. With the power of Sherlock’s AI brain and the experience of Innnovation360 consultants and licensed practitioners to back them up, creative minds everywhere have the means to reframe the world’s toughest challenges and build a more sustainable future. Prepare to regularly revitalize your core value proposition through internal and external Innovation. This is more than just an ideal goal for the modern business. It is an essential survival skill in a hyper-competitive world. How innovative is your organization in comparison with the rest of the industry? Where are your strengths and which capabilities need immediate attention? Where do you want to be by 2020? What’s the bigger picture for the long term? Many critical thinkers over the years have observed that you cannot overcome your current challenges with the same thinking that brought you to this point. It will require a level shift in strategic planning to get ahead, but some organizations are better prepared than others to face this reality and move in new directions. Fortunately, an Innovation Capability is something that can be learned and improved upon through iterative practice. It starts by reviewing your strategy, leadership, culture and capabilities for Innovation – all summarized within the InnovationIQ. The InnovationIQ measures the internal alignment and external expression of your readiness for disruptive market turbulence on the road ahead. Each client will see their InnovationIQ score generated anew every year by one of our consultants or by one of our Licensed Practitioners and tracked for trend analysis. It establishes a baseline to compare what is trending in your Innovation Index, which places your company within the larger context of Innovation challenges at the regional or country level. Your InnovationIQ immediately communicates your readiness for the changes ahead to all of your key stakeholders – your board, your customers, your employees, tour talent market and the greater marketplace. You will be able to display your InnovationIQ anywhere from your website to your annual report, just as you would a great credit rating by Dun & Bradstreet or a “Great Place To Work”. Based on their InnovationIQ scores and Innovation FootPrint from the InnoSurvey®, organizations can identify the priorities of their next strategic initiatives and start moving in the right direction. They can begin developing a long-term Innovation Culture that is conducive to practical creativity. They can foster the work of Innovation Leadership experts who are able to guide change agent teams in profiting from the pathways made and to avoid the mistakes of others. To set an individualized baseline for development, we assessed the Innovative capabilities of more than 1,000 companies operating across 62 countries. Based on multi-faceted data analysis from our Innosurvey® database, we found it possible to distill the genetic components of fruitful Innovation for the business community. InnovationIQ 0-30: Lack of Innovation capabilities, no clear strategy, leadership or culture in place for Innovation. InnovationIQ 31-50: Some Innovation capabilities in place. Strategy, leadership and culture should be developed further to empower Innovation. InnovationIQ 51-70: Strong Innovation capabilities in place. Strategy, leadership and culture aligned with the Innovation capabilities, but there is room for major improvement. InnovationIQ 71-90: Very strong Innovation capabilities in place. Strategy, leadership and culture are aligned with the Innovation capabilities, but there is room for minor improvement. InnovationIQ 91-100: Superior Innovation capabilities in place. Strategy, leadership and culture highly aligned with the Innovation capabilities. This score gives you insights into the specific Innovation Management challenges facing your organization in the context of changes to your industry. Data points cover opportunities in areas such as supply chain, service openings, customer engagement, value capture, and targeted learning channels. We recommend best practices for assigning Innovative development projects across three horizons. Horizon one covers immediate and incremental improvements that return measurable impacts and keep the IT infrastructure at peak performance. Horizon two introduces workable concepts that offer the greatest promise for expansion or market capture, assuring revenue for the future. The third horizon is the most creative and expansive, commercializing applications from the second horizon in original and unpredictable ways. Although these ideas present the most significant potential, it will take precise and intelligent deployment of technologies from the first two horizons to get there. Innovation readiness analysis should concern itself just as much with internal processes as with external offerings. Your InnovationIQ score will indicate which areas could profit most from new approaches, both in terms of profitability and market share. From there, you can go on to reimagine the interactions of your high-performance teams, as well as, test business prototyping sessions. There are many pathways that lead to streamlining workflows and ensuring stronger revenue streams. Initially, they all begin with an assessment to evaluate how ready you are now to seize new ideas and make them work. If you want to assess your Innovation readiness and get an InnovationIQ, contact us directly and we, or one of our nearby licensed practitioners, which are currently in 20+ countries today, will help you. Contact us here. The Swedish-American Chamber of Commerce proudly invited top executives and influencers to this exclusive workshop held at the Swedish Embassy in Washington DC in corporation with the Swedish-American Chamber of Commerce, Magnus Penker and Peet van Biljon. This video explains ideation, innovation management and the three horizons. Get In touch and synthesize data from multiple sources to transform it into a powerful intelligence. If you are interested in partnering for innovation analytics, you are here welcome to perform the free version of the Innovation Assessment InnoSurvey® and download a comprehensive 40-page customized Innovation report, including tangible recommendations on how to sharpen your Innovation Strategy, Leadership, Culture and Capabilities. All the recommendations you will receive are based on what’s most likely the largest Innovation database in the world combined with cutting edge algorithms to assist decision-making and pattern recognition. The questions in the assessment are available in English, German, Italian, French, Spanish, Turkish, Portuguese, Dutch, Swedish, Norwegian, Arabic, Chinese and Russian.